Quality instruments for discerning musicians. 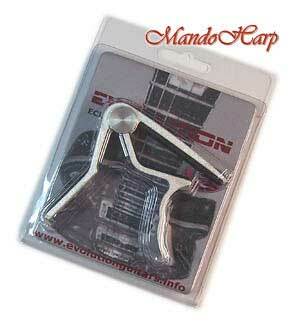 This is a fantastic value, lever-action capo for acoustic and electric guitars. 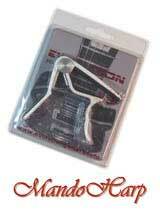 It is shiny cast alloy and the guitar contact points are rubber. 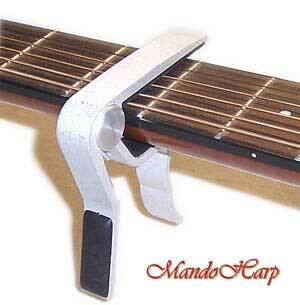 A screw is used to adjust the tension on this spring loaded capo. 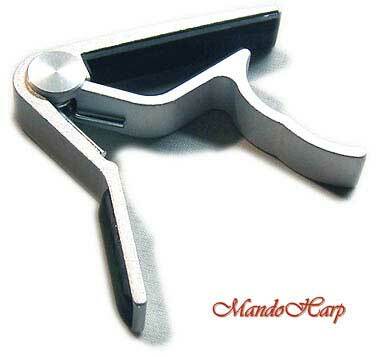 The capo can be quickly applied or removed by pushing the two levers together. 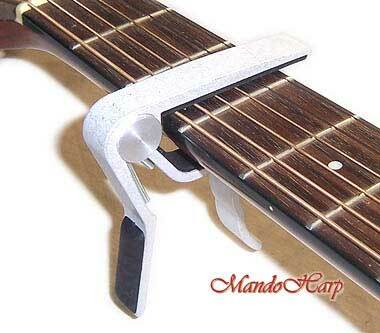 This capo looks great when fitted to the guitar. All MandoHarp instruments bought at a Buy it Now price now include a FREE, 6-month, return-to-base warranty against defects in parts and workmanship included in the Buy it Now price. Extended warranties and warranties for Auction purchases are also available for an addtional fee. Our MandoHarp eBay Returns Policy has now been doubled in length from 7 to 14 days. Please see our eBay Returns Policy listing at the bottom of all our item descriptions. 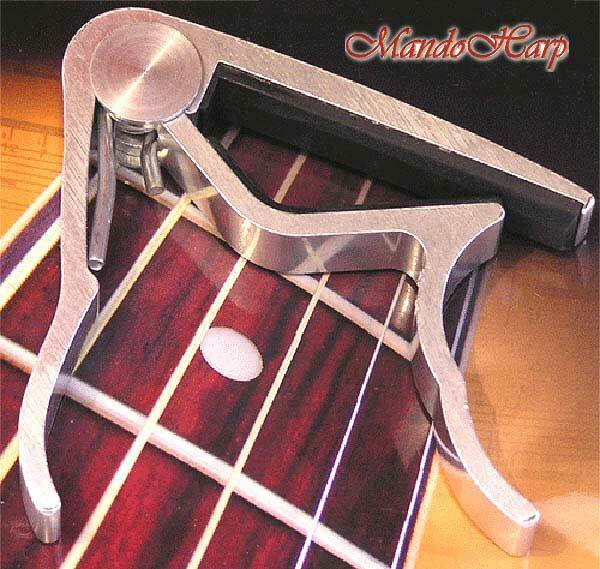 At MandoHarp we play the instruments we sell! Each of our musician and craft associates has over thirty years experience within their area of expertise. At MandoHarp our pimary areas of expertise are Mandolins and Harmonicas, hence our name. We also have associates who work with a wide range of instruments, especially folk. 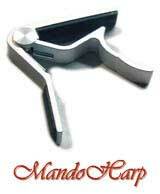 At MandoHarp we appreciate fine instruments and we want you to have them! At MandoHarp we like to get to know our customers - we're musicians and we like to get to know other musicians. We love to talk with musicians whenever possible (probably a bit too much!). And especially musicians who are interested in our instruments. 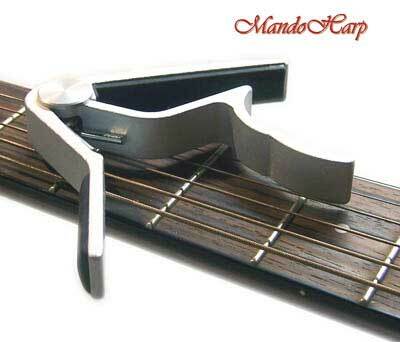 Please feel more than welcome to email (info@mandoharp.com) or phone us (02-65685545) to discuss your music at any time. Inspections, trials and pickup by prior arrangement are welcome at our workshop in Nambucca Heads, near Coffs Harbour on the NSW North Coast. 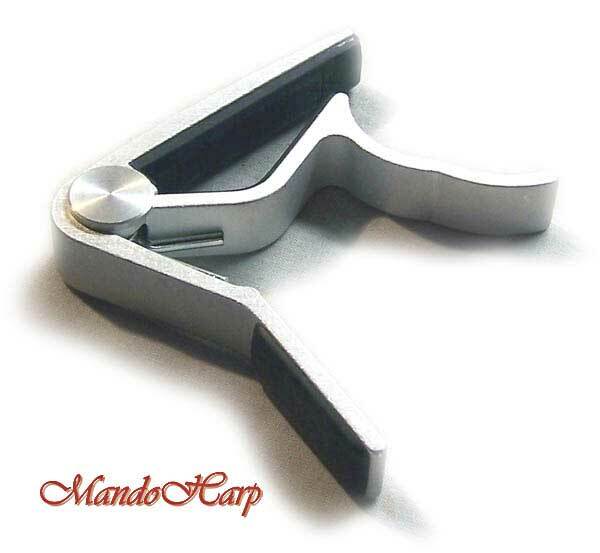 Our goal at MandoHarp is to provide instruments you will cherish for many years to come.